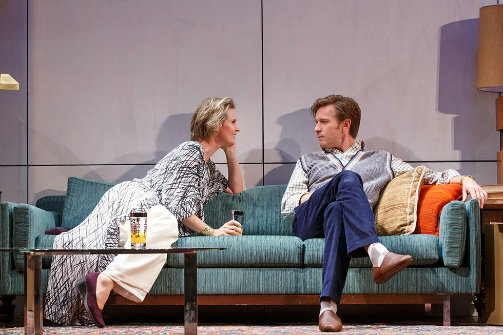 Cynthia Nixon and Ewan McGregor in The Real Thing. Photo by Joan Marcus. BOTTOM LINE: It’s Tom Stoppard, which means it’s smart and funny, and you get the added bonus of seeing a movie star who can actually act! Broadway is quite fond of Tom Stoppard. How fond? So much that they will even give him awards for a 9-hour long play about 19th-century Russian politics (2006’s The Coast of Utopia). Stoppard enjoys the unique position among living playwrights of being able to write serious, cerebral dramas that nevertheless are promoted as crowd-pleasers. New York particularly loves The Real Thing, which premiered on Broadway in 1984 and was revived in 2000, winning Tony Awards both times. Now, thanks to the Roundabout, it’s back again with perhaps its most star-studded cast ever. Ewan “Young Obi-Wan” McGregor makes his Broadway debut as Henry, a playwright whose life and work mirror one another in curious ways. Plays about playwrights (or actors, or directors) are far too common and can be incredibly self-indulgent, and The Real Thing’s characters are quite a self-absorbed bunch, but the play (mostly) challenges them on their narcissism and certainly doesn’t suggest that theatre people are role models or heroes. Henry’s social circle is made up primarily of actors, and the complicated relationships that arise when work and romance collide are the main substance of the play. I’m happy to say that despite McGregor’s limited stage history, his performance is solid and engaging. Joining McGregor in the cast are indie film/off-Broadway darling Maggie "Secretary" Gyllenhaal, also making her Broadway debut, and Tony winner Cynthia “Miranda” Nixon, who appeared 30 years ago in the original Broadway run (making history by simultaneously appearing in another show playing just two blocks away. Yes, really). Saying too much more about their characters would give away plot points that are much more effective if you don’t know about them going in, so instead I’ll say that though I normally enjoy Gyllenhaal’s work, here she left me a little cold. Nixon, however, reminds us why she’s been a constant presence on Broadway for over three decades: she’s always the most interesting person on stage. Director Sam Gold, whose work has been seen all over town in the last few years (most recently in The Village Bike and The Realistic Joneses), strikes me as more interested in stage composition than in directing actors. Luckily he’s got a cleverly designed set, a skilled cast (also including Josh “Hank Foxx” Hamilton), and an intelligent, lively text to work with. The Real Thing gives us Stoppard’s trademark themes (past vs. present, personal vs. political) in one of his more accessible pieces. It’s no Arcadia, but it kept me wondering until the very end--and I never once thought about Star Wars, which I mean as a compliment. Good work, Ewan!